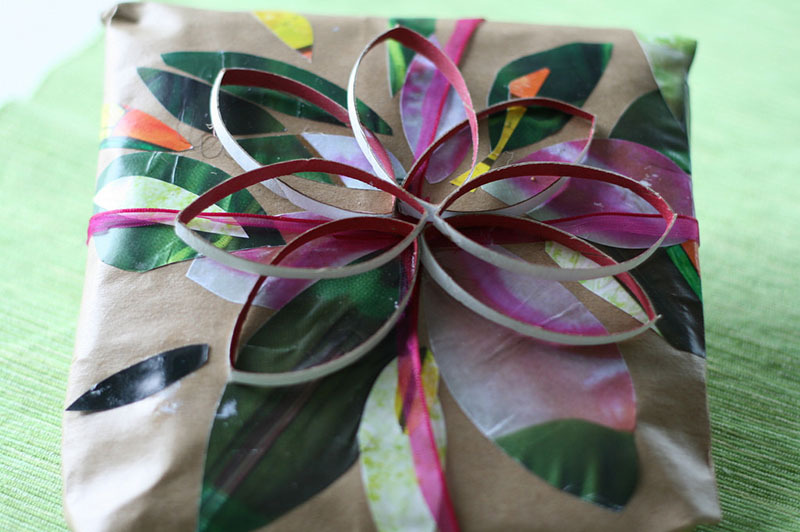 #1…A great way to wrap a homemade gift is with homemade wrapping paper. It’s simple and very versatile. You should start out with a large piece of paper (butcher paper works well) and some paint. Make prints on the paper with handprints, footprints, cookie cutters, or sponge shapes. #2…You can also decorate large paper with pictures cut out of magazines; or you can “write” special messages by cutting words and letters out of magazines or newspapers. This isn’t limited to large pieces of paper; you can decorate plain paper bags or boxes using these same techniques. #3… For something a little more creative— pick an unusual item to wrap the gift in. Of course, the item you pick will depend on the size of your gift. Wouldn’t someone be surprised to find his/her gift wrapped in a decorated oatmeal container, or a tissue wrapped toilet tissue roll? You could decorate paper lunch bags with glitter-glue designs and stickers. (Discount School Supply has nice big white bags) The possibilities are endless! Cover a warming tray with aluminum foil and then turn the warming tray on. When the tray is warmed up — take crayons and slowly draw a design using colors you like. The crayons will melt as you draw. After you achieve the desired design, lay paper towel over the crayons. Take the sponge and gently dab until crayons are complete absorbed into the paper towel. Use tongs to pick up the towel. Allow to dry five minutes and you’ll have beautiful wrapping paper. Deflated Mylar balloons. If you let the air out through a cut in bottom and cut the seams you’ll get two round pieces. How about fabric and wallpaper?! #6 Look for UNQUE AND FUN WAYS to wrap gifts! One very simple way is to USE WORDS! Using a paper with no patterm– write words on it such as: Open Me; Open Me First; Pick Me; You’ll Like Me! ; Here I Am! ; etc. #7 Paper Shopping Bags: Most of us have a stash we aren’t sure what to do with… Just cut the bottom of the bag out and remove bag handles. If the bag has printing on it, make sure that side is face up when wrapping. Decorate as desired. #8. USE A PLAIN OLD LUNCH BAG! 1. Let this be an open and creative project! Put out bags, working supplies and decorations. 2. Cut off the top few inches of the bag. 3. Theme decorate the bag to the gift that will be inside! Example: Is it a Father’s Day paper weight gift? Some ideas to cover the bag could be pictures of Dad’s and desk objects (paper, pen, office supplies) Also since it would be Father’s Day–love and summer graphics could also adorn the bag! Fill in with stickers, etc. #7 Monica from The Homespun Heart states that her favorite gift wrap is BROWN CRAFT PAPER AND TWINE. The photographs below are some creative ways she’s embelished plain brown paper. Some of the many items Monica incorporates into her wrapping are “… pages from old books, mini clothespins, magazine pictures, felt scraps, sticks from the yard, buttons, ribbon and sewing notion scraps.” When wrapping gifts with children, the wrapping proceedure is an artistic endeavor in itself! #9 ARE YOU GIVING MONEY AS A GIFT? Place your paper money (or check) inside of a balloon. (Each of these balloons has a $10.00 bill in it.) Blow up the balloons and then knot and tie with ribbon. The amount of balloons you use will depend on the amount of money you are gifting. You can have one balloon or several. For a birthday, tie the balloons to a party blower. For Christmas tie it (them) to a candy cane. Use your imagination and tie ithe balloon (s) to something that goes with your theme and can be carried. 1. Purchase ‘PRETZEL BAGS’. Place 1 or more pretzels in a bags–dipped side up. Wrap prettily with ribbon and bow and you’re done! To make a”bouquet” of pretzels, stand pretzels dipped-side up and wrap the tops individually in cellophane. Place them in a small vase and wrap it with a bow. 3. Take a TWO QUART JAR and fill the bottom of the jar a few inches with basket filler, shredded cellophane, or scrunched tissue paper. Put a pretty ribbon/bow or raffia around the jar. Stand the pretzels ‘dipped ends up’ in the jar. → FABRIC ON JAR : You can also take some pretty fabric (or tissure paper); place the jar bottom in the middle of fabric/tisue paper; pull the paper up with the material or paper flowing over the jar top. Secure the fabric or tissue paper at the jar lip with a ribbon! 4. You can do the same as the above using SMALL CLAY POTS. 6. Use a dipped Pretzel Rod as a DECORATION! Place a cellophane and ribbon wrapped rod on top of the wrapped gift. Children’s Crafts that Smell Good!